The following quote by Edgar Degas describes the type of art work I most enjoy looking at and which I strive to achieve in my watercolour paintings. "A painting requires a little mystery, some vagueness and some fantasy. When you always make your meaning perfectly clear, you end up boring people"
Some years ago I changed from oils to watercolours, even though the medium had a reputation for being difficult, dull and insipid. Encouraged by Helen Steven, friend and tutor from WCCAC, and inspired by the work of W J Turner, I persevered and found I loved the transparent washes and the way in which the medium had a life of its own. The modern colours are vibrant, exciting and I particularly enjoy the challenges and result of working with a limited palette, say 3 colours only. My guest artists, some of them new artists from WCCAC, some of them experienced artists, demonstrate a variety of techniques, subjects and styles and all in WONDERFUL WATERCOLOUR....Want to give it a go, but scared to? Just remember it's only a bit of paper... 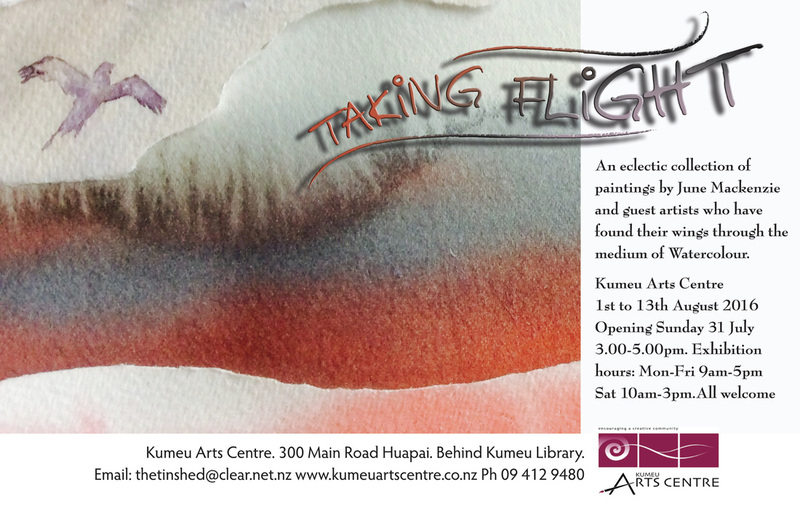 Contact Kumeu Art Centre, which has a number of fantastic and encouraging tutors, who will help you get started.